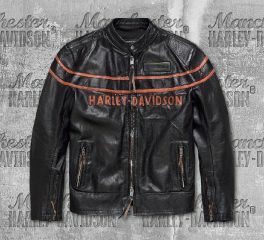 Men's Harley-Davidson® 1903 Collection, vintage designs for men revisited. 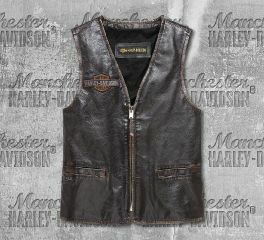 Harley-Davidson® Men's Eagle Distressed Slim Fit Leather Vest is made from midweight cowhide leather, and cotton twill lining. Washed and tumble-dried leather with rub-off finish for vintage look. It features a full-front zipper, snap hand-warmer pockets, and one interior stash pocket. It has also a dirty embroidered patch, embroidered 1903, and distressed printed graphics. Slim fit that fits closer to the body. Harley-Davidson® Men's Crackle Logo Slim Fit Short Sleeve Tee is made from heavyweight 100% cotton jersey, washed for softness. The garment dyed with pigment spray for lived-in look. This short sleeve tee features a distressed printed graphics, rib knit neckline, and slim fit that fits closer to the body. 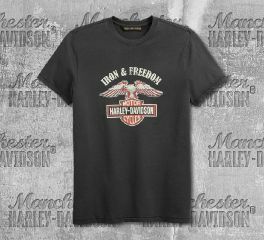 Harley-Davidson® Men's Iron & Freedom Slim Fit Short Sleeve Tee is made from heavyweight 100% cotton jersey. Washed for softness. Garment dyed with pigment spray for vintage look. Rib-knit neckline. Distressed printed graphics. Slim Fit—fits closer to the body. 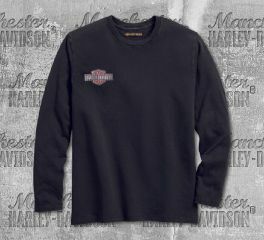 Harley-Davidson® Men's Crackle Logo Slim Fit Short Sleeve Tee is made from heavyweight 100% cotton jersey, washed for softness. The garment dyed with pigment spray for lived-in look. This short sleeve tee features distressed printed graphics, and rib knit neckline. Slim fit-fits closer to the body. 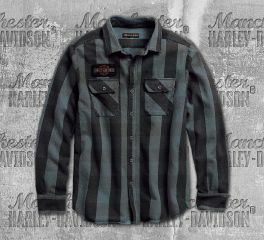 Harley-Davidson® Men's Logo Patch Slim Fit Long Sleeve Shirt is made from 100% cotton twill, washed for softness and over-dyed for worn, lived-in look. It features a snap-down collar, button front and cuffs, button flap chest pockets, dirty embroidered patches, and 1903 embroidered 1903 accent. This long sleeve tee is slim fit that fits closer to the body. 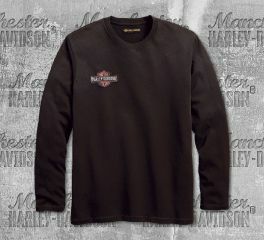 Harley-Davidson® Men's Felt Letter 1/4-Zip Slim Fit Pullover is made from 100% cotton french terry. This pullover is marked with hearty signature graphics including thick patches and beefy felt lettering. A careful dye process achieves the faded lived-in look. It also features a 1/4 zippered front, rib-knit collar, cuffs and waist. Slim fit-fits closer to the body. 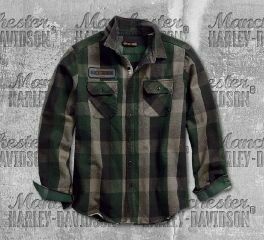 Harley-Davidson® Men's Appliqué Plaid Slim Fit Long Sleeve Shirt has full button front, two button flap chest pockets, and button cuffs. Embroidered patch on the upper right chest, and on the back. Features a Slim Fit that is narrower throughout. 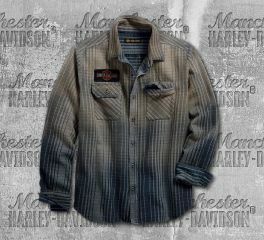 Harley-Davidson® Men's Eagle Plaid Slim Fit Long Sleeve Shirt has embroidered patch on the upper right chest. A multi-colored embroidery on the back is the perfect art for this long sleeve shirt. Features a Slim Fit that is narrower throughout. Like it roomier? Size up. Proudly display your loyalty with the Men's Turtledove Distressed Logo Slim Fit Tee. Features Slim fit design to fit closer to the body. For a roomier fit, size up. 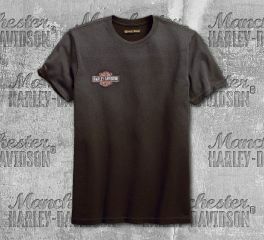 Harley-Davidson® Men's Steel Grey Layered Print Slim Fit Tee has distressed Harley-Davidson® lettering and Bar&Shield printed on the front. Features a Slim Fit that is narrower throughout for a more modern look. Like it roomier? Size up. 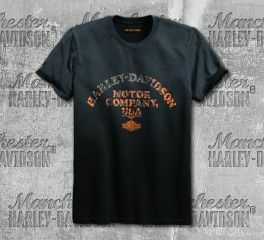 Harley-Davidson® Men's Anthracite Jersey Appliqué Slim Fit Tee has Bar&Shield® Logo on the right chest, and graphic Bar&Shield® printed on the back. Slim Fit- designed to fit closer to the chest and waist. 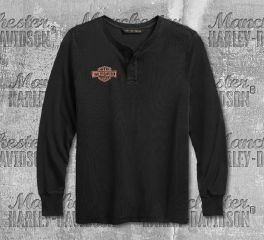 Harley-Davidson® Men's Anthracite Embroidered Long Sleeve Tee features a Slim fit which is designed to fit closer to the chest and waist. For a roomier fit, size up. 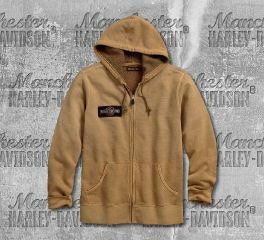 Harley-Davidson® Men's Pale Khaki Upright Eagle Slim Fit Hoodie features a Slim Fit that is narrower throughout. 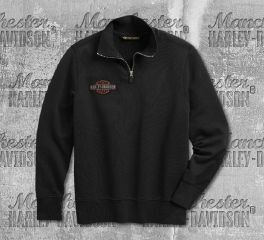 Harley-Davidson® Men's Steel Grey Eagle Logo Slim Fit Hoodie features a waffle-knit lined drawstring hood, and a full front zipper. This men's hoodie features a Slim Fit that is narrower throughout. 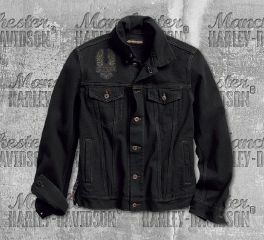 Harley-Davidson® Men's Black Eagle Appliqué Slim Fit Denim Jacket is perfect for casual occasions. Eagle embroidery on right chest, as well as on the back. The slim fit is cut a little closer to the body for a more modern look. Like it roomier? Size up. 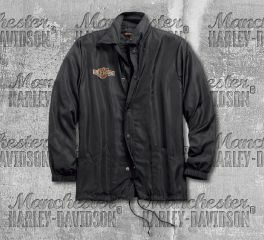 Harley-Davidson® Men's Anthracite Lightweight Nylon Slim Fit Jacket has Bar&Shield logo on right chest, embroidered Harley-Davidson B&S® on back neck, and Winged Bar&Shield logo graphics on back. The slim fit is cut a little closer to the body for a more modern look. Like it roomier? Size up.